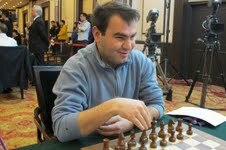 GM Shakhriyar Mamedyarov from Azerbaidjan is the leader of the men's blitz tournament after 8 rounds. Shak was really in good form: playing in an aggressive style, he won 6 games, scoring 6,5 from 8. The only one who beat the leader was Gata Kamsky from USA - he did it in the 7th round. Otherwise the competiton lools like a dream for the Azeri player. He has already beaten many famous players like Vassily Ivanchuk (UKR), Sergey Karjakin (RUS) and the former world blitz champion Lenier Dominguez (CUB). Another former world blitz champion Alexander Grischuk from Russia is in sole 2-nd place with 6 out of 8. Francisco Vallejo Pons from Spain and Maxim Vachier -Lagrave (FRA) are in joined 3-rd place. They scored 5,5 points out of 8. They are followed by Sergey Karjakin (RUS) and Vugar Gashimov (AZE). There are 7 rounds tomorrow for the players to improve their positions.